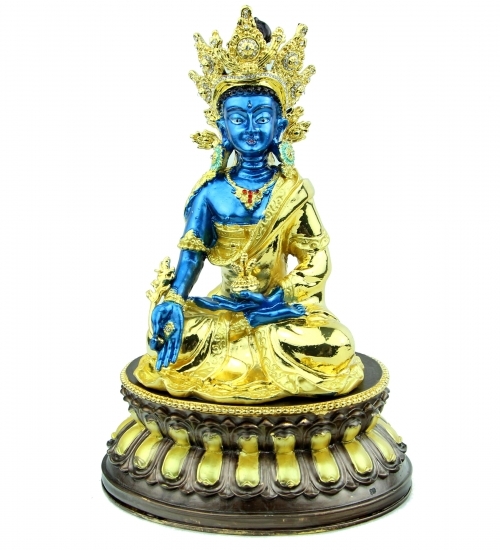 Designed with exquisite detailing, magnificent colors, and excellent craftsmanship, this gorgeous bejeweled Medicine Buddha carrying herb seats on a golden throne and radiates rays of compassion and wisdom. Medicine Buddha is also know as Amitabha Buddha. Amitabha (also known as Amitofu in China and other Asian cultures), is the Buddha of Infinite Light, and is respected for his ability to create harmony and pacify chaos. Place the Bejeweled Medicine Buddha in your room to diminish unhealthy toxins, stabilize internal unevenness, ease loneliness, and increase internal harmony. Medicine Buddha is well known as Nan Wu Amitofu. Recognized as the chief of Lotus Buddha family, Amitabha Buddha has the meaning of unlimited light and infinite life, and is often related to boundless happiness. As head of the Lotus family, he is often featured seated in in serene meditation on a lotus throne and radiating energy that is capable of comforting and pacifying the hearts of those who gaze at him with sincerity and revere. Placing this Medicine Buddha in your home or workplace will promote peace and fortify inner strength. Placing a Buddha figure in a room, home, or workplace symbolizes wisdom, eternal harmony, peace, serenity, forgiveness, and knowledge. In 2018, display the Medicine Buddha in the West Sector of your home to ward off the illness star. He is one of the powerful feng shui products for health. The dimension of the bejeweled medicine blue Buddha is approx. 5" x 4" x 7.5". It is Bejeweled item made of brass and heavy.